A photo of Kelly Jones' pedalboard shows he uses the Boss PH-3 Phase Shifter Pedal in his gear setup. The pedal is the green one on the bottom row of his board, second from his right. A Boss PH-3 Phase Shifter Pedal is used in Mike Einsiger's pedalboard. Dan Auerbach's rig includes an Boss PH-3 Phase Shifter Pedal that is connected on the same loop as a Boss OC-3 SUPER Octave Pedal. #ProductDemo Vai demos the pedal at 13:43, and talks about various possibilities in signal chain placement. 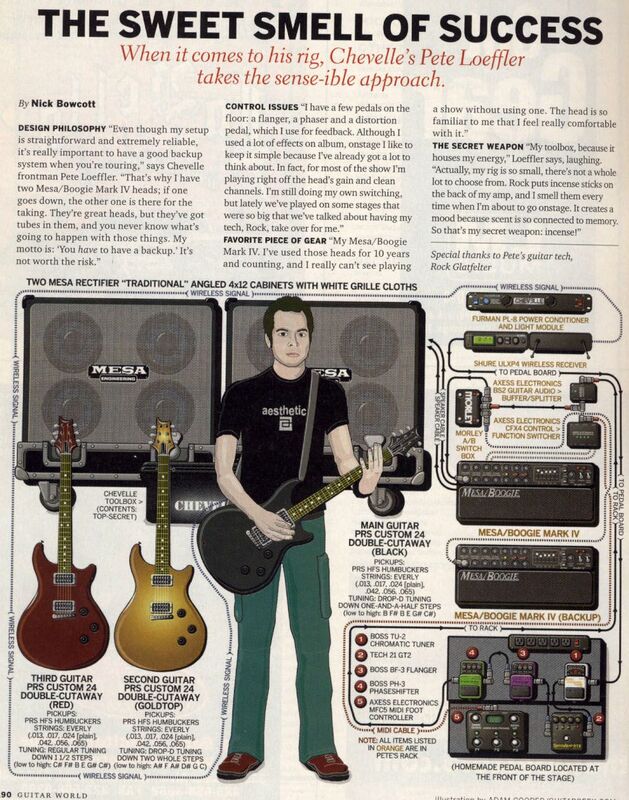 "A Boss Phase Shifter" is used in John Petrucci's pedalboard, according to his guitar tech. As you can see from this picture on instagram, from Tom's studio, he owns/uses the Boss PH-3 Phase Shifter. Dan Steinhardt (from That Pedal Show) posted a picture of that pedal on a board on instagram, mentioning it was build for Graham: "A few tweaks but finished this #pedalboard and delivered it to its new home with none other than #grahamcoxon huge thanks to Joe@thegigrig for being a superstar and helping me get this done"
Jimmy's pedal board has now been reduced to just a few texturing sounds. Guitar > Audio Technica Wireless > Buddha Wah > Boss Phaser > Ibanez Tube Screamer > Boss Tremolo > Ernie Ball Volume Pedal > Mesa/Boogie Dual Rectifier input. A Boss PH-3 can be seen on the left hand side of this image of Cro's studio. Looking at his pedal board, Tony first shows his phaser on the far right side. According to Richardson's pedalboard photo, he uses Boss PH-3 phase shifter pedal. This image comes from a ["Rig Rundown" with *Premier Guitar*](http://www.premierguitar.com/articles/Rig_Rundown_Smashing_Pumpkins_Billy_Corgan). As you can see, one of the pedals towards the bottom right of the board is a Boss PH-3 Phase Shifter. Mr. Vincent Accardi uses the Boss PH-3 Phase Shifter Pedal on his pedalboard. It can be seen on Billys pedalboard. His tech says only that he sometimes uses it in his live shows. "We’ve been experimenting with new stuff lately, but right now my effects include Boss PS-5 Super Shifter and PH-3 Phase Shifter pedals…"
Check at 6:20 when you can see the effects that he has on the table. And when he starts playing the song Them Changes you can clearly hear a phaser along with an octave up from the Whammy. 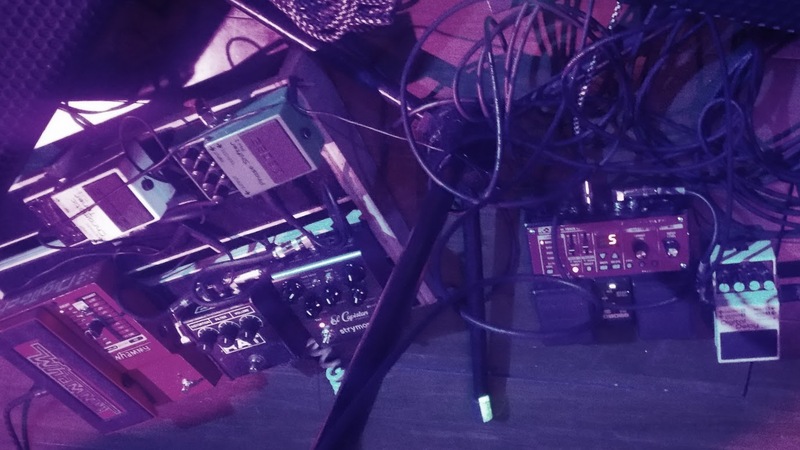 In this photo from Porter, a part of his pedalboard is visible, and the Boss PH-3 is in that batch of pedals. Aaron North on the Boss PH-3 phase-shifter pedal, on a post made December 07, 2009.... "I used this pedal on songs such as "The Wretched", "Please", and "We're In This Together". I also used it quite a bit in The Icarus Line on songs including "Feed A Cat To Your Cobra", "You Make Me Nervous, "Spit On It", and "Caviar". " [The EffectsBay website](http://www.effectsbay.com/2019/03/the-cure-in-africa-pedalboards-of-robert-smith-and-reeves-gabrels/) shared some pictures posted to Reeves' Facebook page. The image showing his guitar pedalboards features a PH-3 pedal. In the pedalboard picture from this interview there is a Boss PH-3 Phase Shift pedal here. The PH-3 is visible inbetween the SD-1 and the TU-3. Mark Speer-"it's not really a mystery. Just a green Boss phaser"
In this post you can see his pedalboard. A phaser pedal that Domhnaill bought immediately after hearing the song Paranoid Android by Radiohead. Domhnaill has no uses for the pedal in any song so far but it's handy to have. "I've been using the PH-3"
Luke Weiler of Positive Mental Trip has used a BOSS PH-3 Phase Shifter live and in the studio since 2015. It can be heard on many songs on the 2017 PMT studio album. Songs like “The Strange Customer”, “Drag To Need”, “As A Friend”, “Circles” and many other Positive Mental Trip songs on “The Black and White Album” have that BOSS PH-3 signature Phaser sound that only the BOSS PH-3 makes. Luke is known to use many other Phasers (or Phasors) live and in the studio but none sound like the BOSS PH-3. It has this grit to it. Most of the Phaser sounds on the 3rd Positive Mental Trip Album will come from the MOOG 12 Stage Phaser... but they will be replicated live with the BOSS PH-3, PH-2 and the TC Electronic HELIX Phaser. I tend to keep it on the 4-stage phaser setting, to get something similar to the MXR Phase 90 except with a bit more control on the sound. I'll rarely use this with heavy distortion, mainly just with clean or slightly overdriven stuff. I alternate this with my MXR Phase 90 because this allows more control. The Rise and Fall options are amazing for adding denser waves of sound! This was an impulse buy, but it's really awesome! In all honesty I don't think I've truly mastered it; it can be tough to use without overpowering your sound, but that's really not a failing of the pedal! The tap tempo is a nice touch, and I love how many options it has. Overall, really fun to play with. I have a very niche use for this pedal, and it does the spacey sound just right if you're doing a Pink Floyd kind of jam ( think Any Colour You Like). We did not turn out to be besties with Boss pedals somehow, I might as well be an Ibanez guy, but I've always found a better option to Bosses. Maybe because of their boxy 80's design, or too digital look and feel. Having owned a few analog phasers, and read the reviews, I did not expect too much from this guy, apart from a bit more versatility, but I could not resist a good second hand price, and it well worth the money. Firstly, this thing sings. To me the 4 stage mode sounds just as good as an analog phaser. To be honest, a bit better in case of the MXR, and a bit less "organic" than the small stone, but the differences are minimal, and maybe appear at playing dynamics, but I could hardly pass a blind test comparison. To my ears the 4 and 10 stage mode sounds a bit more natural than the 8 and 12, I guess the latter may be more beneficial at studio application than live. I tend to keep it on 4 stage for by now, and use the fun modes for solos, especially "fall" which gives a very unique edgy decay for the solo licks. I've also found the step mode usable with appropriate rate settings. And here comes the real fun: an option to synch the rate with the song tempo! This is a feature that all phasers should have! At first I was playing it with an expression pedal, that turns the pedal into a very sensitive wah pedal. It is fun for some songs, but I rather pump it than adjust, as it's not easy to find the sweet spot, but the tap tempo mode does the job very well. If I could ask for more, I'd prefer to have double tap mode too but i you are patient, the pedal is capable to handle very slow taps just as well. This really shows the beauty of phasing. I'm considering to get an exterior switch to tap tempo with it while still having the option to bypass the pedal, but it's not really a necessity, since when I use a phaser I tend to keep it on for the whole length of the song. For the same reason the slight volume drop does not bother me at all. What could be really cool is an option to switch modes with an exterior switch. Might as well be a doable mod. Anyways, this pedal is much recommended, very versatile, and sounds just as good as the classics. Knowing that it drops in volume, would you get it again? I have this on permanent loan in the studio and have used it on cymbals mostly. I havent messed a whole lot of phasers to be honest. But every time i use it, it dampens my tone a lot. Not as clear as i would like. If you have info on why, let me know. Serious phaser. No more, no less. Love the sound and it "breathes" good in any mode. For the awesome sounds that have been secret for years. La guitarra psicodelica de los 70 es uno de los sonidos que más trato de asimilar al momento de crear y este pedal es ideal para eso. La posibilidad de jugar entre la profundidad y la expansión de las ondas es adictivo y siempre dan ganas de buscar más opciones al momento de improvisar. La opción de indicar el tiempo con las pulsaciones hacen que sea muy adaptable cuando se esta creando con la banda. a friend's younger brother hipped me to the PH3 when it first came out...I mean, who uses a Boss phaser? they released a new phaser and I didn't even know it! turns out that the super phaser differentiates itself from the pack with all these useful modes... you can do 4, 8, 10, 12 stage phasing and you can set the LFO to be a ramp, a saw or 'steps'. Let your imagination do the work here!. So you're getting a cool tempo effect that's not trem or delay here in addition to the phasing. Your dad's orange phaser can't touch thata nd it costs more. Everyone needs a PH3 in their pedal drawer. Really fun with synths too. Great phaser loaded with tons of tones! I know that this green box is all-digital, so sure - there might be fatter and warmer sounding analog phasers but I believe it is high time to let digitals do their things. However if you want kind of entry-level phaser, cheap and reliable PH-3 is way to go - 7 modes (4,8,10,12 stages plus three experimental, synth-a-like), full tone control (rate, depth and resonance) and really decent sound quality. I find it to work best in front of a dirty amp (not in fx loop). Also, volume drop was reported on countless threads, but my PH-3 (from 2014) is volume-drop free, works perfect! Good for low sweeps on a clean tone and fast sweeps for more progressive sounds. This is a phase pedal and not a great one at that, a lot of the faster rate settings on this just sounds like a bird chirp underwater. and the slower settings aren't good enough to make up for that. Get an MXR Phase 90 instead. I only tend to have it on one setting and don't over use it, but it's got a great sound.